When we completed his wife’s smile a few months before, Brian saw first-hand how a beautiful smile can change someone's life. Brian was very unhappy with his smile. 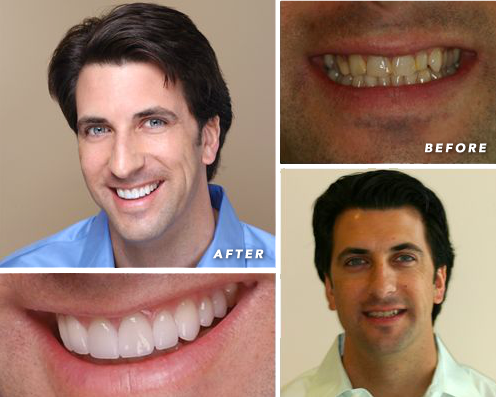 He wanted a more pleasing look to his teeth, and like many clients, he desired a more consistent color in his teeth. He had large spaces between his teeth that had been filled with bonding. He was also missing a lateral incisor. He was lacking symmetry, exhibited uneven contours in his gums, and his coloring was not consistent. Brian has an analytical and creative personality, and we were looking to create a smile that would compliment his personality and looks. We were able to correct the gum line discrepancies, make up for the missing tooth, and give him a color that compliments his skin tone. His smile now looks amazing. "I want to give a huge Thank You! to Dr. Gombert and his team for transforming my smile. I'm very excited with my results, and I'm very impressed with the caring and professionalism displayed by everyone at Parkside Dental Health. Dr. Gombert is the symbol of excellence, and his attention to detail makes all the difference. I highly recommend Dr. Gombert and his team. They will definitely make you smile!"